The monthly container cargo count at the Port of Long Beach rose 24.6% in November compared with the same period a year ago, the port reported on Monday. 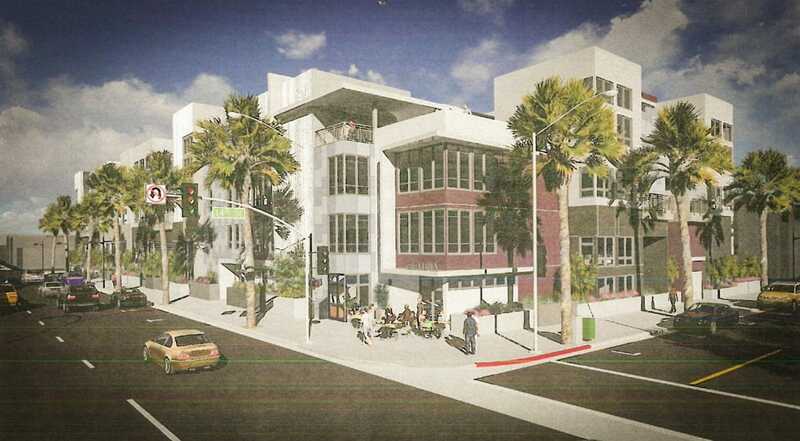 The Long Beach Planning Commission has given their approval for a four-story, 65-unit market rate apartment to be built on the 1400 block of Long Beach Blvd. just south of Pacific Coast Hwy. The mezzanine building will include nearly 70,000 sq. ft. of living space, 90 parking stalls and, perhaps its most interesting feature, a public parklet that will span the 14th Street-facing facade by closing vehicular traffic to the 14th Street alley. However, the Summa Architecture-designed building is less than spectacular, yet again giving into a sense of design that—copying the style that made Studio One Eleven a Long Beach staple—looks dated. While mixed materials are used to create a sense of depth, what it unfortunately comes off as are blocks of patterns oddly paired—one part looks like corrugated metal, one part looks like wood, one looks like perforated metal panels, one looks like stucco, one looks like…—and it creates a sense of distortion and a lack of continuity that is far from welcoming. Perhaps most obvious, it just looks banal. That being said, the final product will likely differ significantly from the renderings.